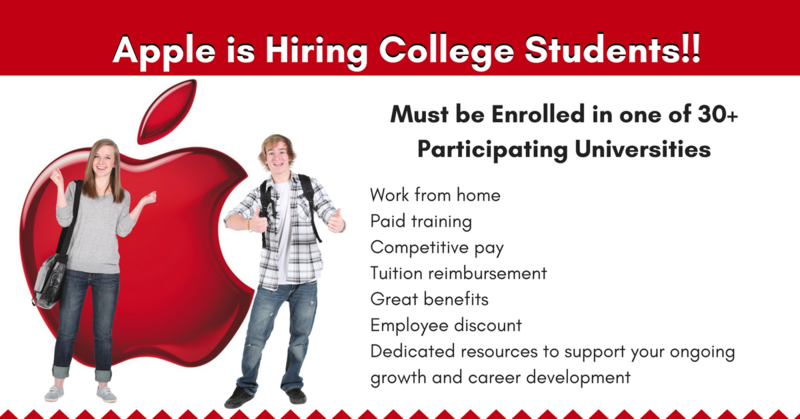 Apple Jobs for College Students – Work from Home! Apple sometimes posts positions for Apple At Home Advisors. Many of our Rat Race Rebels have landed jobs with Apple, and reports overall are very positive. “We expect everything from an Advisor that our customers do and we want Apple to be a reflection of the world around us. You’re a problem-solver and easily connect with customers! You exceed their expectations with your guidance, knowledge, and real passion for technology. You’re enamored by the way things operate, and have the ability to figure out how technology works when things go wrong. You have excellent verbal and written communication skills, as well as the ability to effectively prioritize and manage your time. You can multitask across systems and applications, analyze, isolate and resolve a variety of complex technical issues, and comfortably navigate a technical environment. You effortlessly engage, explaining step by step solutions with patience and an approach tailored to each individual customer. You’re not only here to help fix technical issues, but also provide an incredible customer experience. Because you’ll work independently from home, you’ll need the discipline and ability to work remotely from coworkers and management. If this sounds like you, you could be the next AppleCare At Home College Advisor. This is a work from home position, we can only consider you if you’re enrolled at participating universities. As an AppleCare At Home Advisor, you’ll be supporting many of our popular products, from iPhones to iPads to MacBooks to desktop Macs. As our customers’ first point of contact, you’ll be the friendly voice of Apple, providing world class customer service, troubleshooting, and technical support. We’ll rely on you to listen to our customers and use your technical knowledge, creativity, and passion to meet their needs — and remind them that behind our great products are amazing people. Because we believe our individual backgrounds, perspectives, and passions help us create the ideas that move all of us forward. We’ll train you to be the best. This position comes with competitive pay, tuition reimbursement, great benefits, eligibility to participate in our company stock plan, time off, an employee discount, and dedicated resources to support your ongoing growth and career development. Click here for full details and to apply with Apple. For more jobs like these, be sure to check our Newest Jobs & Gigs page. To get our job postings ASAP, like our Facebook page and check your feed for our posts. May you be rocking your Rebellion soon! This entry was posted in Customer Service Jobs, Hiring Companies, Jobs with Benefits, Work at Home Jobs and tagged Apple, college. Bookmark the permalink.